How do I add and modify text in the Rich Content Editor as a student? 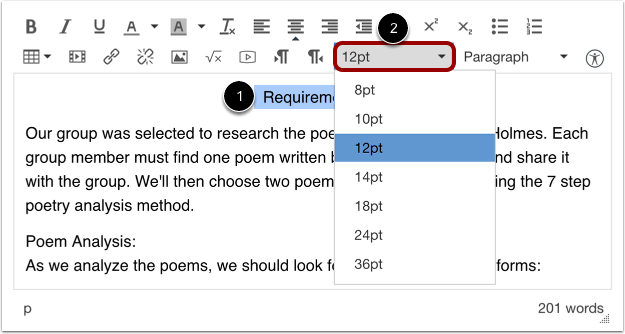 The Rich Content Editor also includes several formatting tools that allow you to modify your text. Paste the text you copied into the Rich Content Editor. To remove text formatting, select the pasted text , then click the Clear Formatting icon . To align text, place the cursor in front of the text you wish to align . Use the tools in the toolbar to align the text. You can set the position of the text on the page with the Left, Center, and Right Alignment tools  or indent the text using the Indent tool . The editor also supports directional text so users can insert content right to left. This feature can be added using the Right to Left button within the editor. Select the text you wish to include in your list . Click the Bulleted List icon to make a bulleted list . Click the Numbered List icon to make a numbered list . View the bulleted list you made. View the numbered list you made. Select the text you wish to modify  and click the Font Size drop-down menu to change the text font size . You can choose from 8, 10, 12, 14, 18, 24, or 36 sized fonts. Select the text you wish to modify , and click the Paragraph drop-down menu to change the text style . 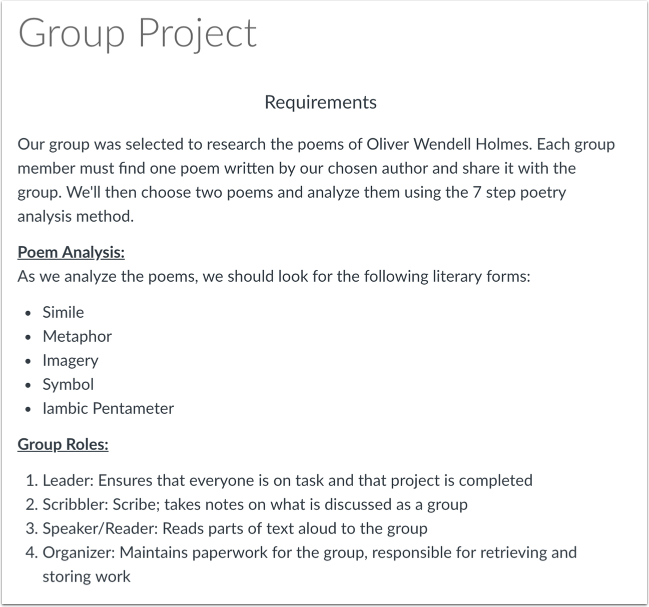 You can choose from paragraph, heading 2, heading 3, or heading 4, or preformatted styles. To create single spacing in the Rich Content Editor, press the shift and return keys (on a Mac) or shift and Enter keys (on a PC). This will create a line break instead of a paragraph break. Select the text you wish to modify , and click the Superscript or Subscript buttons in the toolbar . Note: When using the Rich Content Editor in Assignments, Discussions, Pages, and Quizzes, you have the option to "Save & Publish". 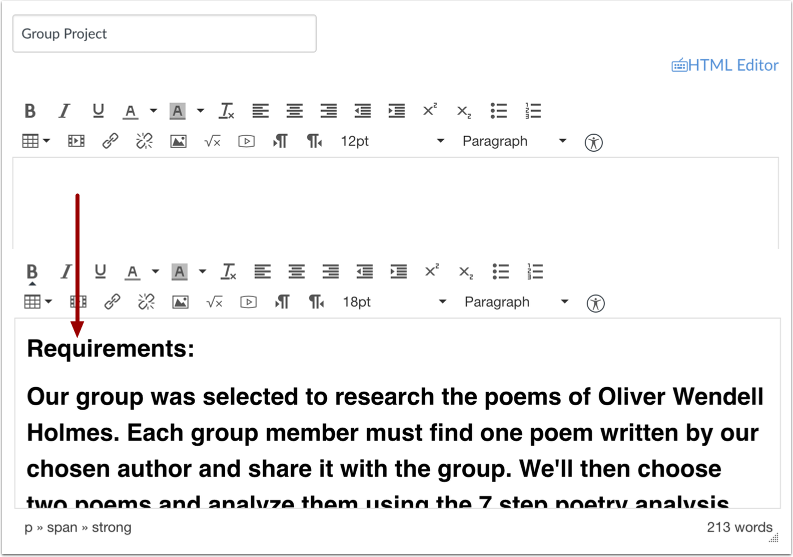 When using the Rich Content Editor in the Syllabus and Discussions pages, the Save button may appear as "Update Syllabus" or "Post Reply". View the content you created. Previous Topic:How do I submit a survey? 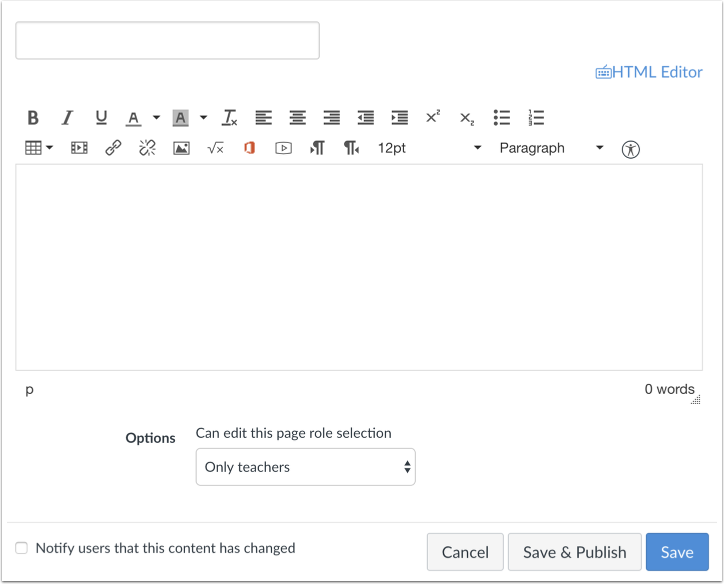 Next Topic:How do I use the HTML view in the Rich Content Editor as a student? 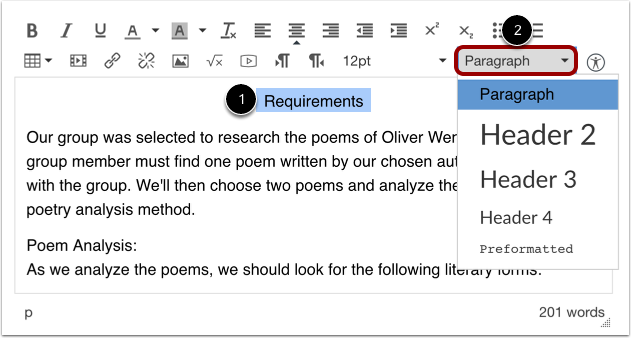 Table of Contents > Rich Content Editor > How do I add and modify text in the Rich Content Editor as a student? Re: How do you enter text in Canvas?